Thank you for visiting our website. We greatly appreciate your interest in exhibiting at Coffee Expo Vietnam. As a potential or participating exhibitor, please feel free to contact Coffee Expo Vietnam 2018 at any time to receive assistance. Coffee Expo Vietnam offers both preset shell scheme booths and open floor space only for independent booths. Booth price varies depending on registration period. The sponsorship booths listed below are identical to shell-scheme booths, but offer exhibitors other promotional benefits. Exhibitors applying for early bird registration must send their booth fee and utility rental fee payment by Oct 7, 2018. Early bird applicants will receive discounted participation fees, priority in booth allocation, and promotional opportunities on the show homepage and in show emails and press releases. Exhibitors who want to construct their own uniquely-designed booth can book an independent booth space. A minimum of two space-only booth units must be booked to qualify. 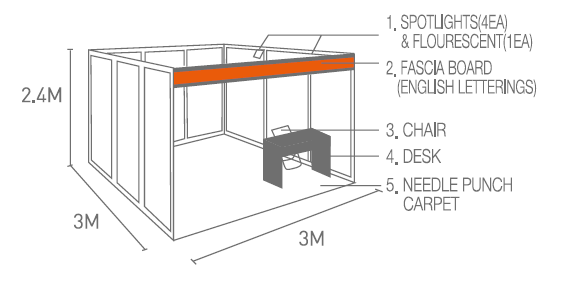 A single space only booth unit is 3m x 3m. For booth construction, exhibitors must choose a contractor from among the listed Vietnam Coffee & Dessert Fair designated service providers. Exhibitors looking for a preset layout can book a shell scheme booth and be guaranteed a low-hassle setup with room for creativity. A sponsorship booth comes with the standard shell scheme booth and special promotional opportunities. The exhibitor will be advertised as a sponsor on the official directory, and the exhibitor’s information will be translated and distributed in direct mail materials to buyers throughout Vietnam. Sponsor exhibitors will also receive promotional opportunities the show homepage and in show emails and press releases. Exhibitors must submit a construction layout plan and receive approval from the Coffee Expo Vietnam 2018 before beginning booth construction. A separate utilities application must be submitted when using any electricity other than the 2 fluorescent lamps included in each booth. This application will be made available on our Download Center. Please note that when construction is done past official construction hours, exhibitors will be charged USD 100.00 per hour until construction is completed. Official construction hours run from 1:00PM to 5:00PM on Oct 29th, and from 8:00AM to 5:00PM on Oct 30th & 31st. (This schedule may have changed based on circumstances). Booth location is assigned on a first-come first-serve basis, by order of registration. The exhibitor has a right to choose the location of their booth. Show organizers will confirm the booth location with exhibitors by sending a PDF of the floor plan before making a final reservation.